Une bière de rafraîchissement qui se boit aux environs de 2~3°C. UPDATED: OCT 22, 2018 From backlog. 0,3 litre Bottle from Systembolaget Charlottenberg. Orange with white head. Malts, hops, yeast and spices. UPDATED: JUN 24, 2018 Fluffy off white head on a cloudy light orange body. Yeast, orange & herb aroma. Medium bodied, soft on the palate with a dry cloying finish. Orange, yeast, herb & spice tastes - a bit limp on the finish. Pale straw yellow. Small. Aroma is wheat spice coriander, taste is the same. Solid wit bier. Bottle from Terre de Boissons Calais and drunk on a train. Soapy Belgian wit aroma. Some peach ester. Oh yes really peachy in the flavour too. Not much hop finish. Character. I mean it's fine. Pale gold colour lasting white head. Easy drinking. Peach and orange flavour on the finish. 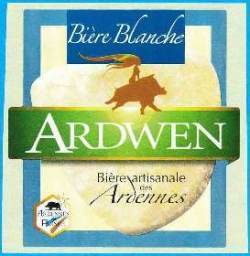 OK.
[ As Ardwen Blanche ]. F: not very big, white, gone to long lasting thin white film. C: yellowish, hazy, non-transparent. A: malty, wheat, coriander, orange peels, spicy, herbal, banana, yeast. T: malty, coriander, wheat, hint of lemon, banana, dusty, medium body, lower carbonation, medium oily mouthfeel, not bad but nothing special, 0,33l bottle from Carrefour in Signy-l’Abbaye in France. Bottle, 33cL. Home. A pale yellow opaque beer ; small bubbly ; big white foamy head ; average retention. Citrus, coriander, cereal and herbal note. Light to medium sweet, light acid refreshing, bitter note. Light body, thin texture, average carbonation, dry acid refreshing finish. Overall, a good witbier ; spicy and fruity (lemon). [email protected] XI. Hazy yellow colour, small white head. Aroma is floral, citrusy and mild wheaty notes. Flavour is fruity, floral, some wheat and mild herbal ntoes. SB Kalmar stor flaska. Citrusarom inte mycket humle. Rund i smaken som en mild Hoegaarten. Inte oäven men lite tunn. Big bottle from systembolaget Sweden. Mild citrus aroma. Bland citrus taste. Low bitterness and taste. A bit booring.